When you create a new marker and want it to drop into place on the map, you can set the animation property of the MarkerOptions object to DROP. The marker will then fall from the sky when added. Also notice that I’ve set the draggable property to true to enables drag and drop functionality. The setAnimation() method takes a constant from the Animation class and can be either BOUNCE or DROP. I’ve created a demo that demonstrates these new features. It adds markers with a DROP animation and you can then make them dance by triggering the BOUNCE animation. The markers are draggable so you can try dragging them around to see how they behave. Be sure to check out the announcement in the article: The map markers! They move! on Google Geo Developers Blog and also check the documentation out. Hi Mr Svennerberg! First, great book (I’m half way through) very clear and concise and great post. I do have one suggestion (for noob readers like myself) if you could for the next book/blog include something on PHP and forms to query MySql to select the markers displayed that would be AWESOME. I have to hard code the criteria in my database query and I feel stupid I can’t get that user interactivity. After reading Gabriel’s book, I code PL/SQL to generate JSON data and work Google maps into an Oracle APEX application. Thanks Gabriel. After reading Gabriel’s book, I coded PL/SQL to generate JSON data and work Google maps into an Oracle APEX application. Thanks Gabriel. Gabriel – great book. Read it through on a recent trip to Jamaica over the holidays, and am reading it again. 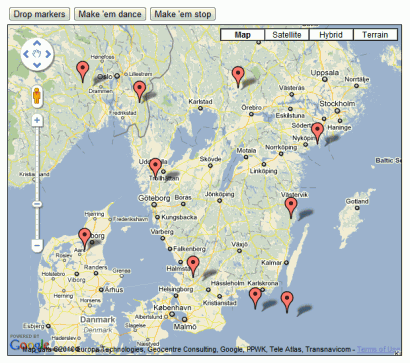 We are using KML files (created by a conversion of shapefile) with our Google API. Any recommendations where to go for more information? I didn’t see any discussion in your book regarding KML and Google API. Erik Schmidt: Wow, I’m impressed that you’re reading it twice! And I’m glad to hear that you like it! I haven’t actually used KML that much myself. But I guess the API documentation is a good place to start. Check out KML and GeoRSS Layers int the docs if you haven’t already. By the way, how was Jamaica? Jamaica was awesome! Great trip and beautiful place. Thank for you code, it help me to understand JS. First of all I’d like to say how great an application this is! But it would be even better to see listings for shares (rent per room is already quite useful) and all of your cool functionalities for canadian cities.